I’ve only mowed a yard a few times in my life. 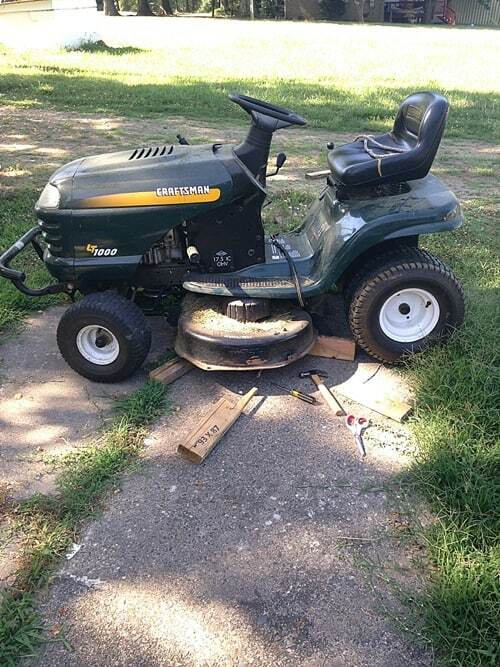 I wasn’t even sure how to turn the lawn mower on! But, Miriam learned to mow in the past few months, and she enjoys it. Between the two of us we got the mower running and made a plan to tag team. One of us mowing, the other watching the youngest of the crew inside. Miriam elected to take the first shift on the mower, but less than one lap around the yard the mower choked and cut off. 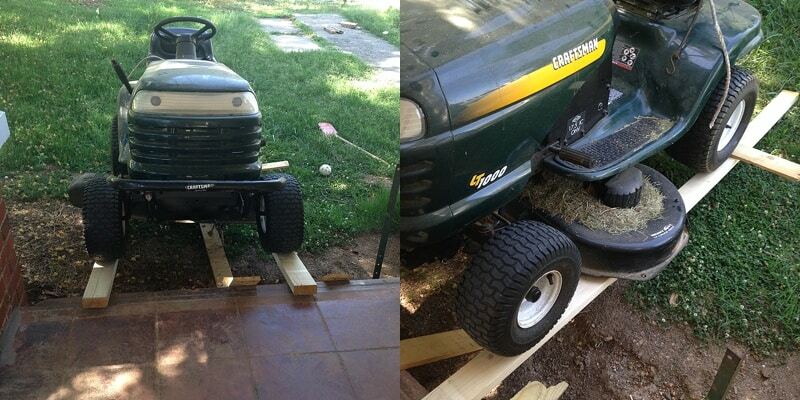 I tried lifting the mower while Miriam slid blocks of wood under the wheels, and wedging the deck up with more blocks. However, no matter what I tried the blade, nor the rope would budge. My next idea was a ramp onto the porch, giving me more room to work under the mower. 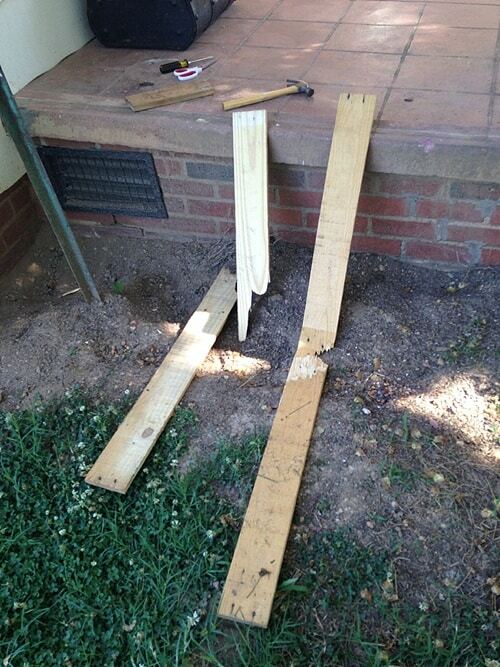 A quick text consult with my Dad, and a few bigger boards meant my second ramp attempt worked. Still that rope was wedged tight. Even trying Dad’s technique of using a screw driver and banging with a hammer didn’t win any slack in the line. 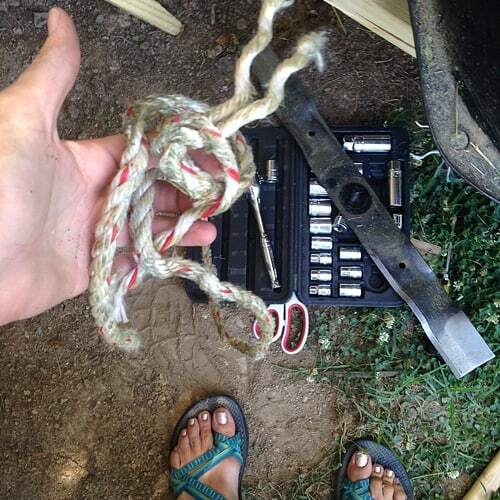 I think the rope spent several of the past mowings under there, choosing today and our first attempt at single Momma yard work to wrap tight and choke out the mower. Why not, right? A ratchet set, and removing a blade finally did the trick. Except during this time the stomach bug hit Miriam. Jon had quite enough of Mommy’s absence, but I knew the day was only growing hotter. I ended up mowing the front yard with a terrified Jon tucked in my lap before he finally consented to go back inside with the rest of the crew. My solo mowing lasted about two minutes before the edge of the deck snagged a dangling clothesline. I’m just glad Jon was inside because, boy, did it sting my feet and legs as it wrapped around the blades and snapped! But, by then Jon was standing at the window screaming anyway, so I took a break to nurse him down for nap and cool off before attempting my second lawn mower repair of the day. Back to my makeshift ramp I went, managing to break the ramp again. Since the boards were long to start, I just shifted them and drove up again. This time, the plastic coated wire melted between the mower and the blade, requiring the ratchet set again and the removal of both blades. Thankfully, the rest of mowing was uneventful with sick kids inside watching tv and Jon napping. I don’t think I could have survived one more mishap that day. The yard looks worse for the wear I’m afraid, but I learned some things. As I tucked Miriam in, she said, “Mommy, you can do all the things. You fixed our water hose so we don’t have to carry buckets of water to the field anymore, you killed the wasps in Clover’s pen, you built a ladder for our fort, you mowed the yard, and fixed the mower!” It felt good to hear the pride in her voice. But, the cost hurts. Today it was half a day outside with my kids fending for themselves inside- the toddler upset the entire time he wasn’t sleeping. I’m already struggling to keep up with my responsibilities here. You Momma’s know- it’s a busy life! And now I’ve added more to my plate, with everything falling to my shoulders alone. Especially right now, with the shattering of my hopes and dreams (again) it feels impossible to bear. The one good thing about walking through this multiple times, this time I know we will survive. Life will go on. Life will be good (eventually). Others will step in where we need help. And I am capable of more things than I ever dreamed. Thank you! I am definitely finding strength I never knew I had! You did an amazing job. I still have not tackled the dreaded lawn mower but I know I'll have to eventually. My moment I knew we could make it was fixing a flat tire without the help of my husband. Oh, I dread that one! I might not have run inside...but I did cry! Do not stress. Things will get done, it will all be there. I have 5 kids and I would rather spend the time with them than trying to make our home perfect. they grow so fast, enjoy them! As a momma to five that does most of it herself I totally get it. Hugs to you though because it can be really tough and yours are all younger, I had older ones that could always help out. At least you can tell you have proud children that know momma will figure out how to get it done if it needs it. Keep up the good work, sorry you don't live near more family/friends. BTW your yard looks amazing. I live in the desert with no yard. Amanda - I'm not sure how you do all this with all the kids at home. What an adventure today. You did so well. So awesome that you're doing this! I can't even imagine the trouble I would get into on a mower like that! I'm so so sorry you had such a rough day mama. But you have such a great attitude, and your kids are watching and will remember that. So glad your daughter pointed out how awesome you are! It sounds like you had a frustrating time but it worked out. 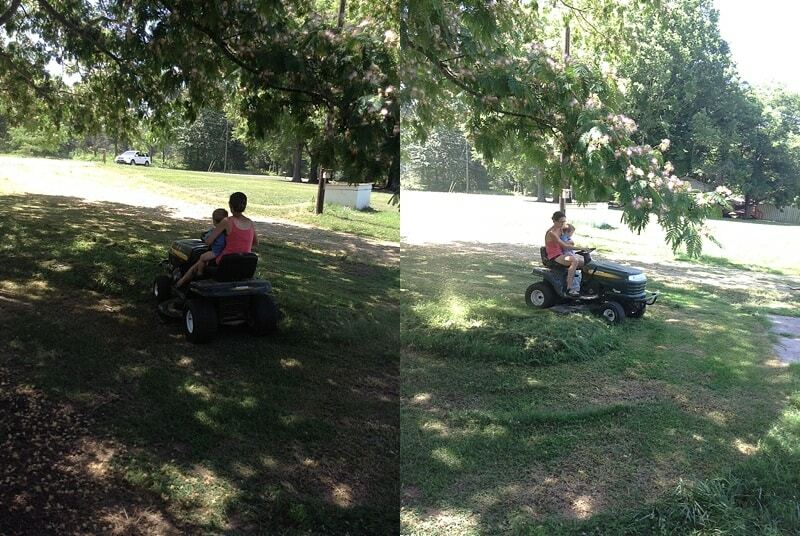 I think it's cool that you have a riding mower and know how to use it. It's good that your kids can see how hard you're working and the results.